Collision Repair Specialists owners and staff are committed to providing you a stress-free experience during your time of need. It is our goal to create a standard of excellence that associates the name “Collision Repair Specialists” with TRUSTED, QUALITY, EFFICIENT, and CUSTOMER-FRIENDLY repairs. In this day and age of friction and volatility we seek to separate ourselves from the controversial and problematic issues that have existed between “body shops” and automotive claims departments and personnel. Why Choose Collision Repair Specialists? We continuously measure our performance to ensure we deliver the highest level of customer satisfaction. We help you navigate your way in dealing with your insurance company. We have a well-qualified staff of professionals that provide outstanding service. We have a wide variety of products available to you. We provide you with a Genesis 2 color print-out documenting the details of your frame repair. 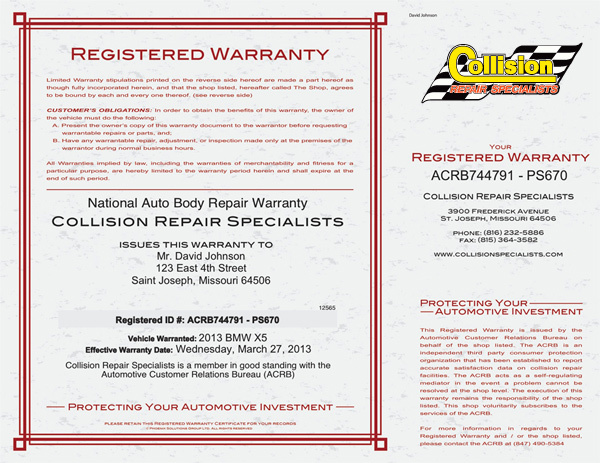 At Collision Repair Specialists, quality and service go hand in hand – Start to Finish for you! Collision Repair Specialists provides additional services and products through the Eaton Group.